Researchers at Mississippi State University, led by Tom Tabler (Extension Professor, MSU Extension Poultry Science) have sampled and analysed litter from more than 200 of the state's broiler farms to determine the effects of various litter treatments and management procedures on the nitrogen, phosphorus and potassium levels in the litter. Mississippi has about 1,900 poultry farms producing 762 million broilers per year that are processed and shipped locally, across the country, and around the world. Poultry has been leading the state as the largest agricultural commodity for 20 straight years. In 2013 alone, farmers were paid $2.7 billion, and 28,000 employees were paid another $2.1 billion in wages and salaries (Mississippi Poultry Association, 2014). Management of poultry litter generated on the state’s poultry farms is an increasingly important environmental issue in Mississippi. Poultry litter is a mixture of manure, feathers and bedding material that is a valuable source of plant nutrients and organic matter. The fertiliser value and organic matter make poultry litter of great interest to many livestock and row-crop farmers across Mississippi. Even though new and innovative methods of utilising poultry litter continue to evolve and develop, land application currently remains the most sustainable option. However, land application of litter is being closely scrutinised regarding short- and long-term environmental impacts, especially as it relates to phosphorus (P) run-off and its potential role in accelerating eutrophication (Sharpley et al., 2009). Eutrophication is a process by which run-off from a source such as a fertilised field may cause a lake, pond or other body of water to become overly rich in organic nutrients, so that algae growth increases rapidly and may deplete the oxygen supply. Additionally, without correctly sampling and analysing litter before it is land applied, there is no way to determine its true fertiliser value. If land application of litter is to accurately meet the needs of the current crop, an up-to-date soil test analysis is also needed. 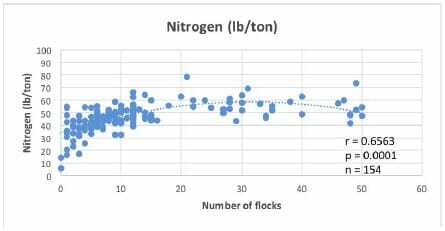 In fact, to remain in compliance with Mississippi’s Dry Litter Poultry General Permit, poultry litter must be analysed a minimum of once annually for nitrogen (N) and P. Furthermore, soil must also be analysed at a minimum of once everyseven years for P content. Currently, the Mississippi State Chemical Laboratory located on the Mississippi State University campus can provide a poultry litter analysis for $35 per sample that determines potash (K2O equivalent) total N, moisture content, P as P2O5 (phosphoric acid) and pH. Nutrient (N-P-K) content is reported on a dry basis, on an as-received basis, and on a pounds-per-ton basis. The Soil Testing Lab (also located on the MSU campus) can provide routine soil analysis for $6 per sample. Extension agents can provide guidance and instruction in proper soil and litter sampling procedures. In addition, Extension poultry and soil specialists located on the MSU campus can provide further assistance, if needed. While the fertiliser value of litter is well recognised, the nutrient concentration can be extremely variable (VanDevender et al., 2000). To date, Chamblee and Todd (2002) reported the only data that currently exists describing the nutrient value of broiler litter in Mississippi. Changes in production practices during the last 12 to 15 years, such as increased emphasis on paw quality, house clean-out schedules, windrowing of litter between flocks, heavier bird market weights, phytase use in the feed to aid in P availability, closely matching P levels in the feed with bird requirements (precision nutrition) and litter amendments used by many growers to help control ammonia early in the flock, may have changed the litter’s nutrient value. Therefore, the objective of this study was to determine the current nutrient value of Mississippi broiler litter. It is important that a broiler litter sample be representative of all the litter in a house. Nutrient values may vary between the brood and non-brood areas of the house. Additionally, there may be nutrient differences in the top of the litter compared to litter that may be several inches deep near the floor of the chicken house. In the current study, to collect a representative litter sample, 16 random samples were taken throughout each of 210 broiler houses representing all broiler integrators located in the state (Figure 1). These 16 samples were placed in a large plastic container and thoroughly mixed together. After thoroughly mixing, a one-quart sub-sample of litter was collected from the container and placed in a labelled and sealable plastic freezer bag. Sample bags were coded so that sample analysis could be done without revealing which grower and which integrator provided the sample. Strict biosecurity practices were followed throughout the study period. Vehicle tyres were sprayed with a quaternary ammonia solution at the driveway or farm entrance at each sampling site. All personnel involved with litter sampling at each location wore plastic boots, biosecurity suits and hairnets. Tools and equipment used to sample were thoroughly scrubbed with soap and water after sample collection before moving on to the next farm. Litter samples were collected from one house per farm. Two hundred and ten broiler farms (roughly 10 per cent of the state’s total) were sampled across Mississippi’s poultry production region from March to September 2014. Grower numbers for each integrator and division across the state are not equal; some divisions are larger or smaller than other divisions. Therefore, the number of farms sampled within each division varied somewhat to account for these differences (Table 1). A round-point shovel was used to dig down to the dirt floor of the broiler houses. In those houses that had a hardpan near the floor, the scientists dug through the hardpan to the floor and included the hardpan in the sample collection. A sharp-shooter shovel was then used to shave off a representative slice of litter (from top of the litter to the floor) at all 16 sampling locations. Each sample bag of litter was stored in a cool, dry place until submitted to the Mississippi State Chemical Laboratory for determination of pH, moisture content, N, potassium (K2O), phosphorus (P2O5) and water-extractable phosphorus (WEP). phosphorus: AOAC modified 960.03; and WEP –AOAC 977.01. Samples were collected across a wide range of litter ages (0 to 50 flocks of production). Mississippi broiler integrators vary in their production practices, resulting in a wide range of litter characteristics. Some integrators may require growers to clean out litter to the floor on a regular basis (every two to three years). Others rarely (if ever) require a total clean-out to the floor unless there is a disease or other bird health issue. In cases where growers seldom clean out to the floor, some litter may be removed occasionally to maintain proper litter depth. Otherwise, the same litter remains in the house and is used to grow numerous flocks over many years. During litter sample collection, information also was collected from growers on their use of a litter treatment to control ammonia at the beginning of a flock. There are several commercial products available that act to acidify the litter by lowering litter pH for the first few days of a flock. This helps control ammonia levels and allows growers to reduce ventilation rates and save on fuel costs. The two most popular products used by growers in the current study were a liquid acidified aluminium sulphate solution and a dry sodium bisulphate solution. Most growers used some form of litter treatment during the winter months. However, there was a small group of growers that did not use any litter treatment for ammonia control. In the current study, most integrators seemed to prefer one litter treatment or the other, and generally, all growers within a complex/division tended to use the same litter treatment (with a few exceptions). However, because of the time frame when litter samples were collected (March to September), litter treatments were not currently in use but had been used the previous winter. There are six broiler integrators in Mississippi, and all six participated in the study. These six integrators have a combined total of 12 complexes/divisions (hereafter referred to as divisions) in the state. Some integrators have only one division site, while others have multiple sites within the state. Integrators allowed MSU Extension Service personnel access to their growers’ farms, provided directions to the farms, assisted with sample collection, and supplied farm background information. To determine the impact of division and litter amendment on litter nutrient value, data were analysed using a completely randomised design with individual farms serving as the experimental unit. When global P values were less than 0.05, means were separated with Fisher’s protected least significant difference. Curvilinear correlation analyses were utilised to examine the relationship of number of flocks reared on the litter prior to clean-out with K2O, N, P2O5, and WEP of litter (Steele and Torrie, 1980). Division had an effect on the number of flocks, litter pH, litter moisture content, K2O, N, P2O5, and WEP of litter (Table 1). There was a wide range of litter ages represented in the study. From an individual grower standpoint, the number of flocks grown on the current litter ranged from 0 (new bedding) to 50 flocks. From a division standpoint, the number of flocks on the current litter ranged from 5.94 to 34.43 with an average of 13.72. Of the 12 divisions in the state, four require their growers to totally clean out the house every two to threee years and start over with new bedding. The remaining eight divisions do not require total clean-outs unless there is a disease or other issue that would warrant a total clean-out; none of the farms in the study had experienced this. Growers in these divisions do remove a small portion of the litter periodically to maintain proper litter depth but rarely (if ever) clean out to the floor. After a portion of the litter is removed, the remaining litter is spread back out and smoothed up for the next flock. Given enough downtime between flocks, roughly 75 per cent of the growers sampled indicated they windrowed litter between flocks while approximately 25 per cent did not windrow litter (data not shown). Not all integrators encouraged or required windrowing. In addition, a minimum of 10 to 12 days is usually required for windrowing to be done successfully. Therefore, growers who normally do windrow may not be able to do so after every flock, depending on the downtime between flocks. Litter pH ranged from 6.67 to 7.61 with an average of 7.08 (Table 1). The range in pH may be related somewhat to litter treatment use. Some growers did not use a litter treatment at all, while some used the liquid acidified aluminium sulphate solution and others used the dry sodium bisulphate solution. However, during the time that litter samples were collected (March to September), growers were not using litter treatments. In general, all growers within a division used the same treatment, although there were a few exceptions. Litter moisture content may also have had an effect on the range in litter pH. Moisture can have a profound effect on pH and WEP (Moore, 2014). If one farm (or division) uses a different ventilation strategy than another farm or division, then the litter may be wetter. Typically, wetter litter means higher WEP and higher pH. If litter moisture goes above 35 or 40 per cent, then WEP can be very high (Moore, 2014). Depending on division, a wide range of bird sizes is grown in Mississippi, from less than four pounds up to 9.75 pounds or more. The larger birds may be on the farm for 63 days or more, making litter management challenging, especially during hot weather when cool cells are running much of the time and birds are drinking lots of water. The litter moisture across all divisions ranged from 23.85 per cent to 30.26 per cent with an average of 26.86 per cent (Table 1). Even though birds were on the farm for much longer periods of time, some big-bird divisions had lower moisture levels than some small-bird divisions. This could be due to several factors, including individual farm management practices, cool cell run times, fan and cool cell staging, ventilation rates, feed formulation, and so forth. The fertiliser nutrient content of the litter samples is presented in Table 1. The potash (K2O) levels ranged from 57 to 67 pounds per ton. The average K2O level across the 12 divisions was 61 pounds per ton. This compares to an average of 59 pounds per ton reported by Chamblee and Todd (2002) in Mississippi and 60 pounds per ton reported by Sharpley et al. (2009) in Arkansas. The lowest level of K2O was found at division 9 (57.02 pounds), which had the oldest litter (average of 34 flocks). The highest K2O level (67.44 pounds) was found at division 12, which had the second youngest litter (six flocks). Nitrogen levels were similar across 10 divisions, ranging from 44 to 50 pounds per ton. However, division 3 had a low level of 39 pounds per ton, while division 11 had a high level of 61 pounds per ton. The low level at division 3 may have been associated with litter age. Litter from division 3 was the youngest of all the litter sampled, with an average of slightly less than six flocks grown on the litter. Litter from division 11 (with the highest N) was the second oldest litter (25 flocks). Nitrogen across all 12 divisions averaged 47 pounds per ton. This compares with 57 pounds per ton reported by Chamblee and Todd (2002) and 62 pounds per ton reported by Sharpley et al. (2009) in Arkansas. The lower N levels in the current study may be related to the large number of growers (about 75 per cent) that windrow litter. Windrowing litter and other litter management practices, such as harrowing and disking, can cause peaks in ammonia emission rates, driving off some of the N in the form of ammonia (Burns et al., 2007; Topper et al., 2008; Liang et al., 2010, Liang et al., 2014). A wide variation in P2O5 levels was observed, ranging from 43 to 89 pounds per ton with an average of 69 pounds per ton (Table 1). Division 1 had the lowest P2O5 level, while division 11 (which also had the highest N level) had the highest level of P2O5. This compares to an average of 69 pounds per ton P2O5 reported in Arkansas by Sharpley et al. (2009), 62 pounds per ton in Pennsylvania reported by Patterson et al. (1998), and 60 pounds per ton in Alabama reported by Mitchell and Donald (1995). There was a distinct pattern related to P2O5, in that divisions that require their growers to clean out every two to three years on a regular basis (divisions 1 to 4 in Table 1) had significantly less P2O5 in the litter than those divisions that do not require regular clean-outs (divisions 5 to 12 in Table 1). The four divisions that clean out regularly averaged 50 pounds per ton P2O5. This lower level may indicate that current management practices, such as phytase use to increase P availability to the bird, careful use of ingredients such as dicalcium phosphate to more closely match the birds’ requirement for P (precision feeding/nutrition), use of high available-phosphorus grain sources, and so forth, are having a positive effect on P content in the litter. The 50-pound per ton level reported in the current study compares favourably to the 60-plus pounds per ton levels reported by other researchers in different states during previous studies (Mitchell and Donald, 1995; Patterson et al., 1998; Sharpley et al., 2009). However, for those divisions that rarely (or never) do total clean-outs (divisions 5 to 12 in Table 1), the P2O5 level averaged 79 pounds per ton. It may be that growers who never totally clean out their houses are concentrating P2O5 in the litter by continually adding to a pool that is already present, compared to those growers who clean out more frequently and start over with new bedding. Phosphorus only exists in a solid state, unlike nitrogen, which can be lost as gaseous ammonia. Thus, any P that is excreted by the birds will remain in the litter (Sharpley, 2014). It may appear that growers who never totally clean-out may be concentrating P2O5 in the litter compared to growers who clean out regularly. However, litter from these growers who rarely (or never) clean out, for the most part, remains contained in the broiler house. Only a fraction of this litter is removed from the house, and only on rare occasions when the litter becomes too deep to manage properly. The majority of this P2O5-concentrated litter stays in the broiler house and is not spread on fields or farmland where there could be an increased potential for run-off. Any possible environmental challenge from such litter is greatly reduced if the litter remains in the broiler house and is never applied to fields or farmland where the environmental threat would be greater. Growers who clean out every two to three years may perhaps be spreading or selling more litter on a tonnage basis but this litter has less P2O5 than litter from growers who do not clean out regularly and much less P2O5 than was applied regularly 15 to 20 years ago. Water-extractable phosphorus levels ranged from 4.95 to 13.38 pounds per ton (Table 1). Division 3 had the lowest WEP level. Division 4 had an unexplained high level of 13.38 pounds per ton of WEP. This was significantly higher than any other division and resulted in asking the lab to run WEP on this division a second time. However, results did not change. In division 3, all of the sampled farms used some form of litter amendment. In this case, 75 per cent of the sampled farms used liquid acidified aluminium sulphate and 25 per cent used dry sodium bisulphate. Both products act to acidify the litter and decrease ammonia levels, which is the main reason the products are used. However, due to their chemical make-up, neither product will have an effect on the total phosphorus content of the litter (Sharpley, 2014; Moore, 2014). An additional benefit to the liquid product is that the aluminium in aluminium sulphate will bind phosphorus to decrease WEP. In addition, the two products may act somewhat differently because liquid acidified aluminium sulphate is applied as a liquid and may more easily react with the litter or, more importantly, the P in the litter (Sharpley, 2014). Table 2 lists the pH and nutrient values of litter for each of three litter treatment groups: no treatment (trt0), treatment 1 (trt1), and treatment 2 (trt2). Each group contained divisions that clean out on a regular basis and divisions that rarely (if ever) clean out. As expected, the group that did not use any type of litter treatment had the highest litter pH because litter treatments lower litter pH. However, pH is dependent on the amount of time since the treatment (if any) was applied and the rate of application. Whatever chemical treatment is supplying the most hydrogen ions will typically result in the lowest pH and keep the pH lower for longer (Moore, 2014). Litter treatments act to acidify the litter, and the researchers saw the effect of that in this study. The pH of litter from the trt0 group was significantly higher than that of either trt1 or trt2. In addition, litter pH from the trt1 group was significantly higher than litter from the trt2 group. Keep in mind that the study was conducted from March to September at a time when growers were not using litter treatments, although most had used them the previous winter. Typical application rates are 25 gallons per 1,000 square feet of the liquid acidified aluminium sulphate solution and 75 to 100 pounds per 1,000 square feet of the dry sodium bisulphate solution, and these are applied, in most cases, only to the brood area of the house. Growers may purchase and apply sodium bisulphate to the litter themselves and may choose to apply less than the recommended rate in an effort to save money. However, this may result in less effective ammonia control and a greater risk to air quality early in the flock unless dequate ventilation is maintained. Liquid acidified aluminium sulphate must be applied by a licensed applicator, who should ensure that the recommended rate was actually applied. From a nutrient standpoint, there was significantly less N in litter from the trt0 group than in either of the litter amendment treatment groups. This was not unexpected because, as mentioned previously, litter treatments acidify the litter and decrease ammonia loss, which helps keep more of the N in the litter. There was no significant difference in N level between trt1 and trt2; however, numerically, trt1 litter contained more N than litter from trt2. The level of K2O was similar for the trt0 and trt2 groups. However, K2O was significantly greater in the trt1 group compared to both the trt0 and trt2 groups. No significant difference was noted between trt1 and trt2, although trt1 tended to be higher, numerically. Similar results were found for P2O5 levels. There was a significantly greater level of P2O5 in the litter from trt1 than in either trt2 or trt0 litter. There was no significant difference between trt1 and trt2, although, similar to K2O, trt1 litter tended to be numerically greater in P2O5. The level of WEP in the trt0 litter was significantly less than in either litter treatment group. In addition, trt2 litter had significantly less WEP than trt1 litter. At first glance, it might appear that the litter treatments had made a difference in the nutrient levels in the litter. However, because the chemical make-up of the litter treatments used by growers in the current study (aluminium sulphate and sodium bisulphate) do not have an effect on the total P in the litter (Moore, 2014; Sharpley, 2014), the differences observed in P2O5 and WEP are likely the result of some other unknown factor. The differences could perhaps be related to diet formulation differences among the various divisions. Different divisions may be using different levels of total P in the diets and may also be using different amounts of enzymes, such as phytase, to better aid P absorption, which can have a significant effect on WEP. Also, dicalcium phosphate (dical) is relatively inexpensive in the overall feed formulation scheme, and some nutritionists may include additional dical to ensure the birds receive enough calcium and phosphorus in the diet (Moore, 2014). However, any P not utilised by the bird will be excreted, and this will likely increase the total P and WEP in the litter. 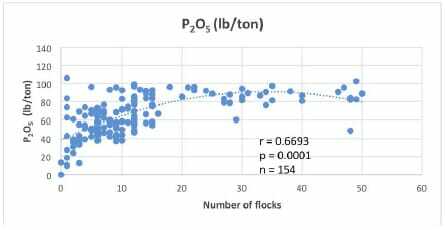 Based on the number of flocks grown on the same litter, nutrient concentrations of N, K2O, P2O5, and WEP in litter tended to increase until 15 to 20 flocks had been grown and then tended to stabilize (Figures 2 to 5, respectively). However, there were a few high nutrient levels in the first or second flocks for some samples. This may be related to the fact that some growers who were on their first or second flock on new litter had not cleaned out the hardpan when they cleaned out the house from previous flocks. Some growers purposely leave the hardpan in place so that the clean-out equipment does not dig into the pad, causing the floor of the chicken house to become uneven. A floor that is not level throughout the house causes serious issues related to correctly managing the height of the feeder and drinker lines throughout the house. When the litter was sampled, this was done all the way to the floor. If the hardpan remained in place under new litter, the hardpan was included in the sample. This hardpan likely contained a more concentrated level of nutrients than the new bedding material, and that was reflected in the analyses. New bedding alone that was sampled (without a hardpan in place) had very low nutrient levels. Litter was sampled from 210 broiler farms across Mississippi from March to September 2014. There are 12 broiler divisions across the state growing a variety of bird sizes, and all 12 divisions participated in the study. One-third of these divisions require their growers to clean out litter to the floor every two to three years. The remaining two-thirds do not require a total clean-out from their growers unless there is a disease or other issue that warrants a total clean-out. 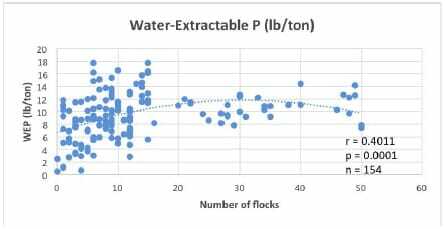 Division had an effect on number of flocks on the current litter, pH, moisture, K2O, N, P2O5 and WEP. 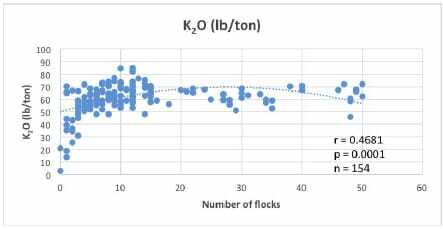 Nutrient levels (pounds per ton) of K2O, N, P2O5 and WEP increased until the litter was about 20 flocks old and tended to stabilise after that. There were also differences between treated and untreated litter with regard to ammonia control products. However, the litter treatments used for ammonia control (a liquid aluminium sulphate solution and a dry sodium bisulphate solution) should not affect the total P in the litter. Therefore, differences in P may have been related to diet formulation or some other unknown factor. Untreated litter had a higher pH and lower levels (pounds per ton) of K2O, N, P2O5 and WEP than treated litter. There was no difference between the two litter treatments for levels of K2O, N and P2O5. However, WEP was greater for trt1 than for trt2. Divisions that clean-out regularly had less P2O5 in the litter than levels reported by several researchers in previous studies from different states during the past 20 years. This may indicate that current management practices, such as phytase use, closely matching diet P levels to the birds’ P requirement, and so forth, are having a positive effect on reducing litter P levels. Even though P2O5 levels were higher in litter for those divisions that do not practise regular clean-outs, the large majority of this litter remains contained in the chicken house, where it is less of a potential threat to the environment. Burns, R.T., H. Xin, R.S. Gates, H. Li, D.G. Overhults, L. Moody and J. Earnest. 2007. Ammonia emissions from broiler houses in the southeastern United States. Proc. Int. Sym. Air Qual. Waste Manag. Ag. Sept. 2007. Amer. Soc. Ag. Bio. Eng. St. Joseph, MI. Chamblee, T.N. and R.L. Todd. 2002. Mississippi broiler litter: fertiliser value and quantity produced. Mississippi Agricultural and Forestry Experiment Station Research Report. Vol. 23, No.5. June. Liang, Y., G.T. Tabler and K.W. VanDevender. 2010. Ammonia emissions from downtime litter management in broiler housing. Proc. Int. Sym. Air Qual. Manure Manag. Ag., Dallas, TX. Amer. Soc. Ag. Bio. Eng., St. Joseph, MI. Liang, Y., J.B. Payne, C. Penn, G.T. Tabler, S.E. Watkins, K.W. VanDevender and J.L. Purswell. 2014. Systematic evaluation of in-house broiler litter windrowing effects on production benefits and environmental impact. J. Appl. Poult. Res. 23:625-638. Mississippi Poultry Association. 2014. Poultry’s Impact and From the Farm to the World. Mitchell, C.C. and J.O. Donald. 1995. The value and use of poultry manures as fertiliser. Alabama Cooperative Extension Circular ANR-244. Moore, P.A., Jr. 2014. Personal communication. Patterson, P.H., E.S. Lorenz and W.D. Weaver. 1998. Litter production and nutrients from commercial broiler chickens. J. Appl. Poult. Res. 7:247-252. Sharpley, A., N. Slaton, T. Tabler, Jr., K. VanDevender, F. Jones and T. Daniel. 2009. Nutrient analysis of poultry litter. Arkansas Coop. Ext. Ser. FSA9529. Sharpley, A. 2014. Personal communication. Steele, R.G.D. and J.H. Torrie. 1980. Principles and Procedures of Statistics: A Biometrical Approach. McGraw-Hill Inc., New York, NY. Topper, P.A., E.F. Wheeler, J.S. Zajaczkowski, R.S. Gates, H. Xin, Y. Liang and K.D. Casey. 2008. Ammonia emission from two empty broiler houses with built-up litter. Trans. ASAE. 51:219-225. VanDevender, K., J. Langston and M. Daniels. 2000. Utilizing dry poultry litter – An overview. Arkansas Coop. Ext. Ser. FSA8000. Authors of this paper were Tom Tabler, Extension Professor, MSU Extension Poultry Science; Ashli Brown, Mississippi State Chemist, Mississippi State Chemical Laboratory; Gale Hagood, Quality Assurance Manager, Mississippi State Chemical Laboratory; Morgan Farnell, Associate Professor, MSU Extension Poultry Science; Chris McDaniel, Professor, MSU Poultry Science; and Jon Kilgore, Mississippi Farm Bureau Federation.